Gotta watch out. Things are not always as they seem. Take note of this old-timey picture among the items collected by my dear old father-dad. Who are these people and why is Myrt so cautious? 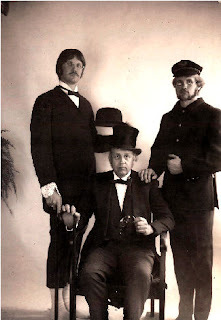 Well, this photo was made circa 1970s in one of those old-style photography studios that provide period clothing designed to make curious-looking pictures like this of people as if they lived during the Victorian era. Undated photo from the author's collection. My dad Glen S. Player. M. D. is seated, wearing the top hat and a serious expression. My step-brother Jim Bennett is pictured on the left and my brother Mike Player is pictured on the right. Just goes to show that you should be very careful not to misjudge a photo. FOR FURTHER READING - from Amazon.com. 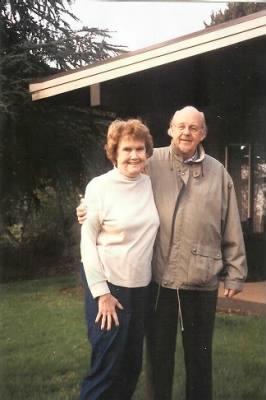 NOTE from DearMYRTLE: Since the time of this original posting (1996), my father passed away (2007) and the property on Overlake Drive was sold to a neighbor (2008). But the memories of our croquet games lives on! The following appeared back in the early days of the internet, when DearMYRTLE first ventured out on the net using AOL's webspace for subscribers, a service option that has since been discontinued. Thank heavens for the Internet Archives WayBack Machine for this copy archived at: http://web.archive.org/web/20020113125717/http://members.aol.com/dearmyrtle/dad3.htm. Rather than the Best of the Internet this week, I must take this day to pay tribute to my own father-dad on Father's Day 1996. Although my father is healthy and active, none of us know how much longer our time together on earth will be. As you can guess, I already am teary eyed thinking about this! On June 1st, we got together for the high school graduation of my daughter Carrie, the last of the bunch. Dad and my step-mom flew over just for the occasion. I am not sure if he realizes what an impact that had on her. The time and attention we give our children and grandchildren says something to them about their worth in our eyes. It lets them know they are something special. In my case, I remember my father would often take us on weekend jaunts and summer vacations. He took us for target practice in the "wilds" of eastern Washington with a pellet gun. I thought shooting bottles off of rocks was pretty rough at the time. Looking back, I see he was teaching us responsibility, and safety... first hand. He had a movie camera, and took shots of us jumping into the swimming pool at Sol Doc Hot Springs on the Olympic peninsula. Then he rigged the film backwards so it would always show us jumping up out of the pool. Quite a phenomenon in the days before America's Funniest Home Videos! Each summer he hosted several large picnics for the office and church friends. These included barbecue fish, roast pig, lots of potato salad, swimming in the pool by the tea house, even water skiing down at the lake! Then, of course, there are the marathon croquet games. Surely, you've heard of the SUMMER OLYMPICS CROQUET GAMES?!! I say Olympic, because not only are they Herculean feats of physical and mental agility, but they are played in the shadows of Washington state's Olympic mountain range. Actually GAMES is a misnomer here! This is Serious Business in our family! We have a dog-legged court with 30 foot rockery and hedge obstacles, not to mention the eight foot drop from the starting stake to the first single wicket! Grass here is painstakingly manicured, with careful attention to changing patterns for mowing each week! Sometimes it looks like a Scottish tartan plaid after the lawn service does Dad's bidding! Preparation began years ago in the smaller croquet court between the house and the swimming pool. Such flat, unobstructed playing fields now pose no challenge to the well-seasoned participants of today's games. The newest top quality equipment is stored in it's specially designed protective covering, to the side of the court, poised for play at a moment's notice. Somehow the retired set of mallets and well-worn balls still remain close by, should someone wish a final glance at the instruments of brutality from former days of glory. Extra good grandchildren are sometimes allowed to play pre-game skirmishes at the sidelines with these color-faded relics. Dressed casually, as if to deny the import of the occasion, each Player grabs his favorite mallet. There is never any question of who gets what color. It is somehow silently understood, and the group proceeds around the corner to the starting post. Volleys are shot - closest to the stake wins first turn, and team players alternate in relative age order from there. the site of the infamous Summer Olympic Croquet Games. The man-eating juniper hedge is off camera to the right. Onlookers pace, and finally settle on the re-woven lawn chairs on the south deck off the living room. From this high vantage point one can view all but the 1st and 6th wicket. Yet, to tread onto the playing court is considered in poor taste, so one must rely on the grimaces and gloats on the Player's faces to judge how the game is progressing. The audience follows the time-honored tradition of hushed voices. They know each shot is a matter of life and death. Zelda, on the deck at court's edge. on the upper south lawn of their home. However, nothing can compensate for the killer, man-eating juniper hedge between the first stake and the first single wicket. Should one ever have the misfortune of misplacing the starting shot, it takes a major operation to retrieve the ball from the dark, 7 foot reaches of the well-trimmed bush's feisty branches. This delay of game is not penalized, however, for it is merely considered an extension of the sport. There is no end to the length to which Players and onlookers will go to devise plans for the locating and retrieval of said errant ball. Flashlights magically appear from all corners of the court. Coat hangers, broom sticks, old golf clubs, customized 2x4s... anything is fair game for an arm extension. One year, they even resorted to hedge clippers and a post hole digger to resolve the lost ball situation! Once this hazard is settled, the play moves on. Tension mounts! Special light sensitive spotlights were long ago installed to aid optimum visual acuity as the dusk settled on the Players. Demands for instant replays, and questions of rules are always settled by Dad. After all, it's HIS court! In our family, its not ONLY how you play the game that counts, its also who WINS! Personally, I think you're a WINNER, Dad! 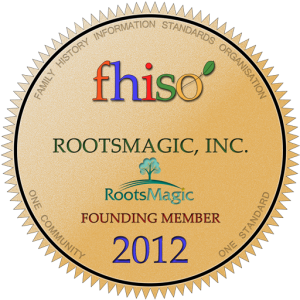 For over 20 years, RootsMagic, Inc., has been creating family history software, starting with the popular Family Origins and continuing with RootsMagic, the award-winning genealogy software which makes researching, organizing, and sharing family history fun and easy. Over the years RootsMagic has released other programs to help people preserve and share their family history. Personal Historian helps users write and preserve their life stories. Family Atlas makes creating custom family maps fun and easy. And Family Reunion Organizer takes the headaches out of planning those important get-togethers. 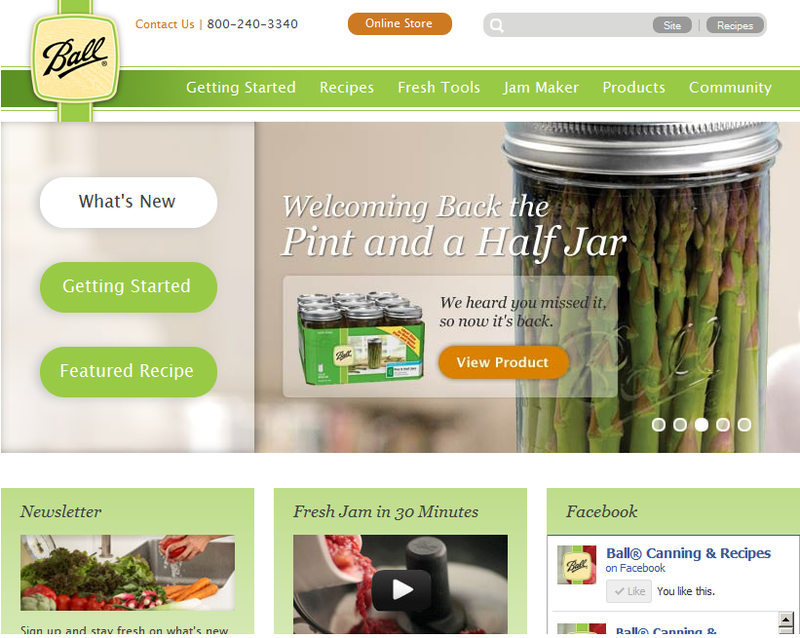 For more information about the RootsMagic family of products, visit the company website, http://www.rootsmagic.com. How my Gramma Myrtle loved to make pickles! Among her favorites were sweet gherkins, mustard pickles and the unusual "watermelon pickles". I say unusual, because I think of watermelon as a cool, juicy, summertime treat. These pickles are made from the white part of the watermelon rind, and are cooked down in a sweet syrup. When I say cooked down -- I mean it. It takes about 16 cups of the white part of the watermelon rind to make 4 or 5 pints of the watermelon pickles. So try packing these in 1/2 pint jars to make them "last" over the winter. 3/4 cup salt dissolved in 12 cups of water. circa 1965, Puyallup, Washington. Original in possession of the author. Item #3: Add the spice packet to the following in a large pot. Bring to a boil, then remove from heat to rest for 15 minutes. Item #5: Gramma would remove the spice bag, opening it on the side counter so she could place one cinnamon stick in each of the jars. She would fill the jars to within 1/2 inch from the top, with rind, juice and the cinnamon stick. It didn't seem to matter of some of the mustard seeds or cloves got into each clean jar before securing on a new lid from her collection of rings. She used a big water-bath canner, making sure to cover the jars by perhaps an inch or so of water. Processing time to seal the jars was 10 minutes. She used a implement to retrieve each jar from the canner, placing them upside down on a cookie sheet lined with a terry towel on her kitchen table. 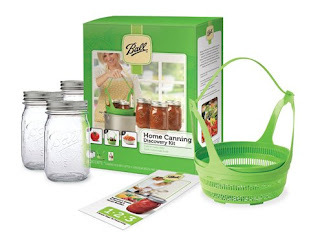 I remember playing checkers, "give-away" (opposite of checkers) and solitaire with a deck of cards on the dining table to pass the time while the jars were "cooking" in the canner. She told me to listen for the "pop" of the jars as they cooled on the kitchen table, meaning they had sealed. An hour or so later, Gramma moved the jars to their upright position, and wrote the date with a grease pencil on each lid. She told me if you could press down on the lid, and it "gave away" the jar was not sealed and the contents were not safe to eat. Unlike dill pickles that must ferment and "take in" the dill flavor for about two months, watermelon pickles are good to eat immediately. It is best if you keep the a jar in the fridge, so you can enjoy the cold, sweet flavor at a moment's notice. Room temperature from the pantry is OK, but I love 'em cold from the fridge. It's a lot of work, but the resulting watermelon pickles are surprisingly sweet. But it takes a family reunion of sorts to come up with 16 cups of watermelon rind in the first place! Folks have asked why Ol' Myrt here doesn't just blog about the items I post to my Facebook page or Twitter feed. Quite honestly, it is to save time. Each morning I use the Zite app on my iPad as a "news aggregator" in e-magazine format. It has options to "share" including Twitter, Google+ and Facebook among others. Ol' Myrt here uses those three methods to share information from a variety of news and blog sources, including genealogy blogs. I dedicate about 30-60 minutes a day on this, whenever I have internet access. If I decide an article is worth bringing to your attention, I tweet, Facebook and Google+ the link to my followers. Here's a bit of what's come to my attention, and has been cross-posted on my Facebook page, to give you an idea of content relevance. Red text below is my commentary, followed by a link to the article, and a quote when available. 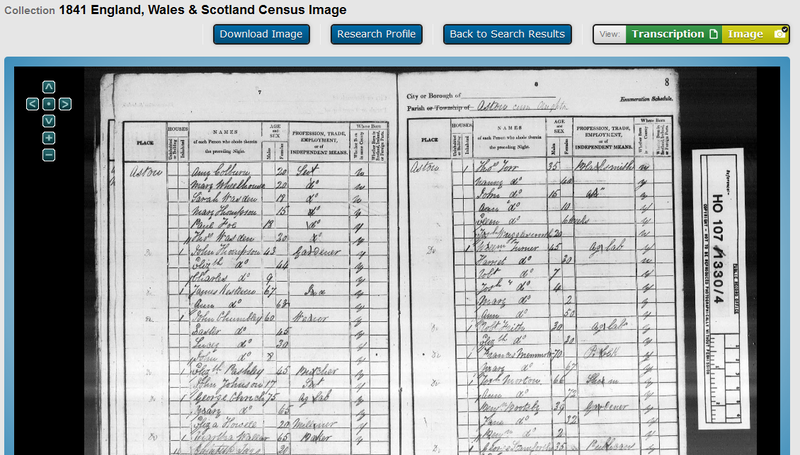 Louis Kessler's take on the SkyDrive concepts and the Relative History app -- implications for genealogists. Louis Kessler’s Behold Blog "About 5 years ago, I was very impressed when my best friend, who lives in Vancouver, sent me a link to his Picasa Web Album with photos of his trip online, a service provided by Google, I was able to view, comment on, and download the pictures, as were all the others he shared the files..."
Crowd sourcing at its finest. Archivist seeks help in identifying manuscript waste material | Cultural Compass "Inspired by individuals who had made extraordinary discoveries about historical photographs by sharing them on the popular image-hosting site Flickr, I hoped that something similar could be done with images of medieval manuscript waste." You won't believe the image of Chain Bridge. On the front line of American history: Remarkable photos capture life in besieged Washington during the Civil War "Defending the nation’s capital, which was ripe for invasion by Confederate forces that had set their sights on the city, became a top priority for the U.S. government." Without antibiotics or sterilized surgeries, it is amazing anyone survived. 5 Medical Innovations of the Civil War "The bloodiest war in American history was also one of the most influential in battlefield medicine." Underground storage -- limestone caves at Lee Summit Federal Records Center - a brief overview from an employee's point of view. Working in the National Archives: Caves "I spent the first month (at least!) getting lost as I tried to navigate through the labyrinth of huge rooms. Thank goodness my supervisor took pity on me and drew me a map, or I would have never made it out of the office!" If you'd like to pick up on what I post besides articles in my blog, be sure to follow me on Twitter, G+ or Facebook. The links are provided below my signature. Combine your webinar archive and your Youtube videos? Thank-you for posting the WordPress webinars in your archive at DearMYRTLE.com. I was wondering why you also have additional space over at YouTube? Why not keep everything together? The short answer is: YouTube provides free space and bandwidth for short videos. DearMYRTLE Workshop webinars are too lengthy to be accepted. Followed by: I'd like to use free space whenever possible to cut down on the costs of providing video content to my followers. But to make things easier for you, I'll place a link to DearMYRTLE's YouTube videos on the webinar page. If genealogy instructors are looking for a great blog post that demonstrates how to cite sources and give credit where credit is due, Ol' Myrt here suggests the 5 July 2012 blog post titled "EvidenceExplained.com" by Carolyn L. Barkley in her blog GenealogyandFamilyHistory.com which she bills as "A Blog About Genealogy Books and Their Authors." 1. Who inspired you? In the opening lines of Carolyn's blog post, she credits Randy Seaver's 3 July 2012 Tuesday's Tip1 at GeneaMusings as the inspiration for her post. She elected to give the URL (web address) reference in footnote 1, copied below. "A new addition to this body of work is a website: Evidence Explained: Historical Analysis, Source and Citation Usage. The website is one that should be used by anyone researching family history or writing a family history, a blog article, a client report, or any other type of genealogy-related writing." 3. Footnote citations Carolyn used the typical long line separating the text of the blog from the footnote section, and then proceeds to give six citations - 1 to a blog, 4 web pages and 2 forum discussions. 1 Randy Seaver, “Tuesday’s Tip – Check Out the Evidence Explained Website,” Randy Seaver, Genea-Musings, 3 July 2012 (http://www.geneamusings.com/2012/07/tuesdays-tip-check-out-evidence.html : accessed 3 July 2012). Michael Hait, CG(sm) "Analysis of the Elizabeth (Smith) Hait family history, 1938, part one ," Planting the Seeds Blog, posted 18 June 2012 (https://michaelhait.wordpress.com : accessed 23 July 2012). ," The Demanding Genealogist Blog, posted 24 May 2012 (http://demandinggenealogist.blogspot.com : accessed 23 July 2012). Note in the 4th paragraph, Barbara gives the titles of a website, and elects to list the URL separately. If all genealogy bloggers were as careful to give credit where credit is due, it would be a lot easier to judge a compiled genealogy and the perpetuation of false lineages would be cut down considerably. Just a note of thanks for recognizing Taneya's extraordinary talent and hosting the [WordPress] webinar series. I'm retired now and have the time and the passion to develop our family history project. I feel so fortunate to have such generous and gifted people as both you to assist in my learning process. Even though I'm 73 years young, I've always embraced technology. But, keeping up is challenging. You have made me believe, "I CAN do this". I still have much to learn. EXCITING! A HUGE THANK YOU to Taneya and Myrt from "Grandma Genee" and our entire family! 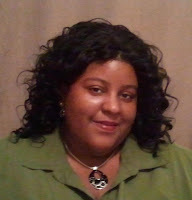 Without Taneya's great teaching capabilities, I wouldn't have gotten so excited about moving my blog to WP soon. Thus series was a win-win for all involved! 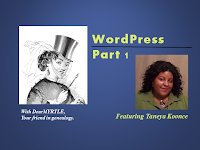 Now I am pleased to announce all four WordPress Webinars with Taneya Koonce are now available in DearMYRTLE's Webinar Archive where from time to time I place copies of previous presentations. This is the direct link to DearMYRTLE's WordPress Part 3 with Taneya Koonce. Alternately, right click the link below and select 'Save As...' or just click to save the file to your computer. This is the direct link to DearMYRTLE's WordPress Part 2 with Taneya Koonce. Alternately, right click the link below and select 'Save As...' or just click to save the file to your computer. This is the final segment of our powerful WordPress instruction featuring Taneya Koonce. You know this entire series has got Ol' Myrt here excited. Catch the three previous sessions in DearMYRTLE's webinar archive. Maintain a network of over 4,000 FamilySearch Centers throughout the world providing training and access to genealogy microfilm, fiche and websites. GEDCOM was originally developed by the LDS Church (commonly known as Mormons) for data file transfers of membership records between local wards and branches and administrative offices in Salt Lake City, Utah. Church membership records include info on folks who move, marry, add children to the family or die. The fields and protocols in the church data file sharing evolved into GEDCOM as it worked well for sharing data between genealogists with common ancestors. At the time, PAF (Personal Ancestral File) was essentially the only game in town for individuals to organize their compiled data. As other genealogy programs came along, they elected to comply with GEDCOM to make their software capable of importing data originally typed into PAF. This made it easy for PAF users to begin using those other genealogy programs. In deciding not to update PAF Personal Ancestral File desktop genealogy management software, it would appear FamilySearch began to recognize other developers have great products. This frees up time for FamilySearch developers to concentrate on what FamilySearch does well. In the "genealogy sandbox" developers should play nicely together, without forcing one developer's will on another developer's project. I suspect FamilySearch plans to insist that all FamilySearch Certified software comply with GEDCOM X.
FamilySearch has elected to develop a product AND develop standards. This doesn't work for me for the simple reason that FamilySearch neglected the current GEDCOM these last 15 years, and therefore does not have a good track record in maintaining a product and a standards system for genealogy data transfer. You cannot have a single developer create a product AND set a standard for the entire industry. It's like the fox guarding the hen house. Looking through the window at a project isn't the same as sitting together as equals around table in neutral territory. From GEDCOM X today we read: "The official GEDCOM X repository is established by FamilySearch at FamilySearch/gedcomx. " That FamilySearch placed aspects of the GEDCOM X work on Github may be considered "transparency" but there is no official cooperation with FHISO or any external genealogy standards organization. Though the GEDCOMX.org website invites developers to join the effort, there is no real "joining" for outside groups in the critical development stage. The needs of genealogy researchers aren't considered without their participation, and the GEDCOM X site is so technical as to "put off" any participation from responsible end users from the get-go. Unfortunately, the laudable "Genealogical Proof Standard" espoused by US genealogists and discussed at FamilySearch's GEDCOM X doesn't reflect the thinking among well-regarded, non-English speaking genealogy developers and tens of thousands of their end-users. Cooperation is essential to arrive at a workable standard for all parties. I learned this from participation in BetterGEDCOM. As an end-user, once my research coincides with someone from another country, a universally (read that 'globally') accepted 'genealogy data transfer' standard becomes essential. Yet, FamilySearch is still requiring everyone to play in the FamilySearch sandbox. From FHISO's homepage accessed today we read "The standards will solve today’s interoperability issues independently of technology platforms, genealogy products or services. They will provide opportunities for innovation and will address robust user requirements such as search, capture and research administration." "Our work includes publishing the standards, relevant documentation, and providing further services to encourage acceptance and adoption of the published standards." How about each developer sending a knight to participate?